Using ultra-clear brackets and tooth-coloured wires, Six Month Smiles is a revolutionary adult orthodontic solution. As its name suggests, the treatment straightens your smile in around six months. It’s fast acting, highly successful and virtually invisible. 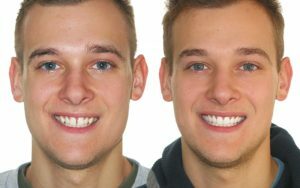 Some people are put off by the length of time they assume orthodontic treatment takes and many think they will have to have teeth taken out – but that’s most often not the case with Six Month Smiles at Thorpe Lea Dental in Staines. See what can be achieved with Six Month Smiles cosmetic braces. Contact us now to book your free of charge consultation at Thorpe Lea Dental.